Made from top quality EVA rubber, these functional yet good looking sandals for men and women make good cheap fishing footwear for the recreational fisherman or fisherwoman. Light weight and water resistant we found these Warrior fishing sandals comfortable to wear even for a long day fishing! There is plenty of ventilation to keep your feet cool or let them dry off if you wear in the rain or on the water's edge. Wear them in the boat, on the beach, down by the river or in the canoe, and even plenty of places away from the water as well. Remember, plastic sandals are generally not suitable for rock fishing and they simply don't provide enough grip. 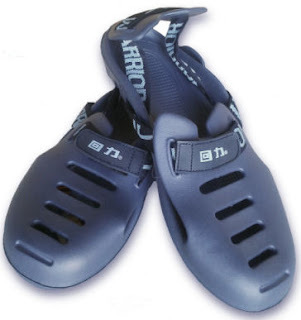 At RRP 29.95 (or just $20 online), Warrior sandals are certainly a cheaper alternative to Shimano Evair Shoe, Crocs or other brand name plastic fishing sandals. Available in black and blue in mens and womens sizes. Visit PlusOne.com.au to buy online or for stockists.